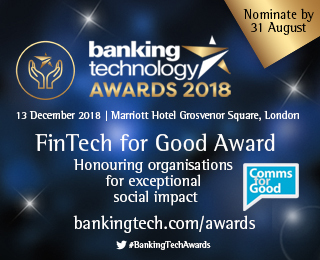 A new addition to this year’s Banking Technology Awards‘ categories, the FinTech for Good Award, will honour a financial services or technology organisation for its outstanding contribution to a charitable cause. The FinTech for Good Award – in collaboration with Comms for Good – celebrates organisations that actively put the wider community first and demonstrate the values of connection, collaboration and generosity above and beyond the usual confines of business goals. Whether it’s demonstrating a strategic commitment to tackling social issues, developing innovative ways to engage employees in supporting the local community, or collaboration with industry peers to deliver sustainable impact for charitable causes, this Award will recognise the vision, leadership and spirit of collaboration that going beyond basic corporate social responsibility requires, and the universal and lasting positive change it inspires. Sounds like an organisation you know? Find out more about the FinTech for Good Award or explore other categories at this year’s event. The winners will be announced on 13 December in London. Entry deadline is Friday, 31 August. Interested in sponsorship opportunities or booking your seat at the event? Get in touch with Jon on jon.robson@knect365.com, or call +44 (0) 203 377 3327. Enter the awards by 31 August.